This is a follow-up question to another thread (Geotagging photos with smartphone camera?) I asked a few days ago. Using my smartphone, I have figured out a way to geotag photos using an app called Geotag Photos. This app, once you follow all the steps, can create Geotagged jpeg photographs accessible from a Desktop PC. My goal is to convert these to a Google Earth Photo Overlay (KML?) which places all the photographs in their appropriate geo-locations on Google Earth. I'm lucky enough to have an old version of Picasa installed which can do this very easily. 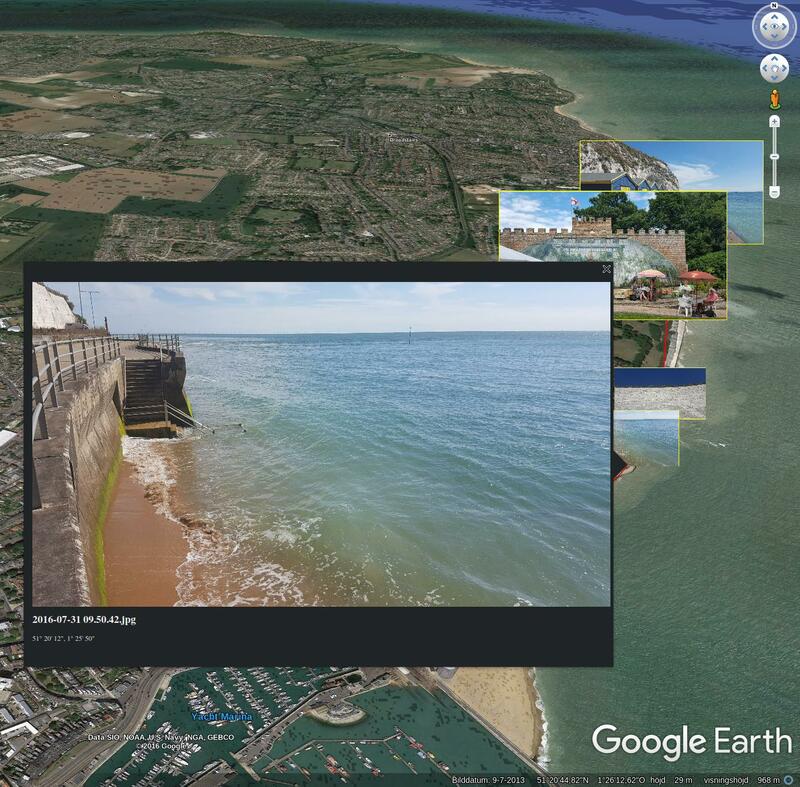 It does this by creating a link with Google Earth and displaying all the photos in their appropriate locations. However, Picasa is being discontinued by Google, to be replaced by the much inferior Google Photos feature online. How about this program called GeoSetter? First of all the disclosure: I wrote Mapollage. Mapollage is a photo kml generator for Google Earth, Marble and tools like that. It has a lot of different settings under each tab, but all with sane defaults. There is an online documentation available describing each option in greater detail. Besides the GUI it is also possible to run the profiles from a scripted environment. This solution should be future-proof since it is open source and available on github. 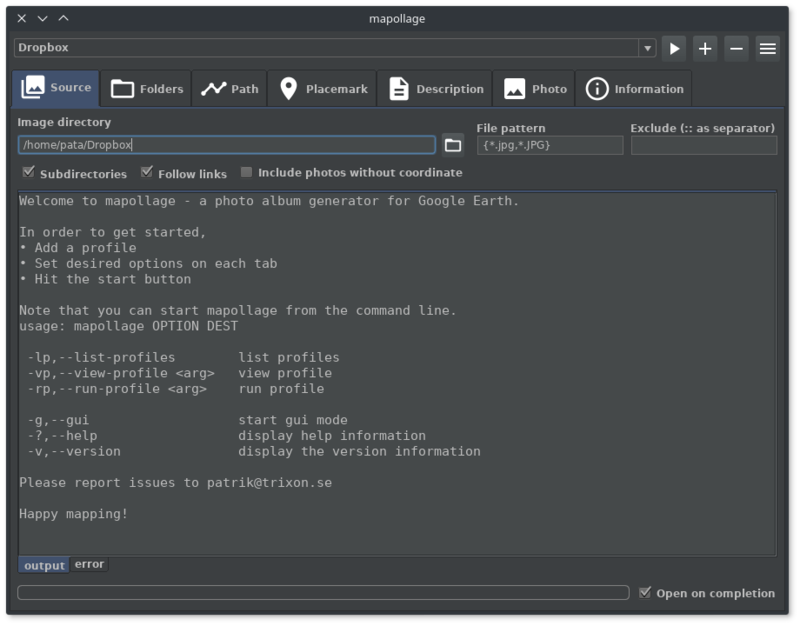 Mapollage is written in Java and runs well on Linux, macOS and Windows. That the entire directory and the KML had to sharable/movable without losing the links to the photos. The original image needed to be viewed (not just a reduced resolution version of the image). The tool will only create a point on Google Earth and is not as fancy as Mapollage, but you can click on the point and see a reduced resolution version of the image, then open the image in Google Earth to see the full resolution version of the image. The KML needs to stay in the same directory as the images. Exiftool has extentsive geotagging support. The page states "This section gives examples for creating GPX and KML output files from a set of geotagged images, or from a geotagged video file". One useful tip that I missed first time through... Put the kml in the same folder as your pictures. If you want pictures to be embedded in the kml, you can save it from Google Earth as a kmz. That makes the file size huge but may be what some people need. I use a simple freeware program Photo GPS extract. It's works easy and extract it to kml file which you can drag and drop in Qgis. http://www.pge.bvsoft.be/downloads.php. I'm now testing including the option for rotated viewpoint which is saved in the exif data. So you can see which direction you took the picture. As someone who is conducting research using geotagged photos, I understand your pain. To make a long story short, Flickr will do what you want. I do not recommend it though. Google has recently re-introduced these capabilities, although the workflow is not nearly as smooth as Picasa or Picasa Web albums. Here is a link to a KMZ file of two photos geotagged by my phone. I navigated the .jpg files into My Maps by adding them as layers, then exported to KML. I did all of this on my Google Pixel in just a few minutes. The browser based version of My Maps seems to have an import tool that will drag in entire albums of geotagged photos from Google Photos, but that doesn't appear to be working on my phone. Not the answer you're looking for? Browse other questions tagged google-earth geotag or ask your own question. Deriving Topographic Information from Geotagged Photos?